A JBM stump grinder removes a stump quickly and easily. Save yourself serious efforts. 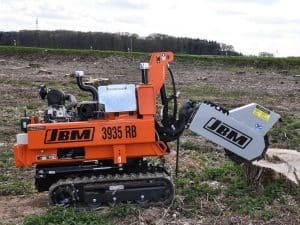 A JBM stump grinder with the power and endurance appreciated in JBM machines will support you. 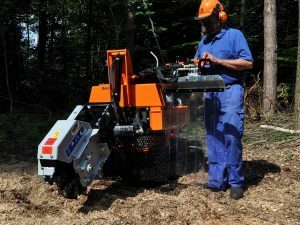 Ease of operation: For example, thanks to the unique KDS swiveling system of our handheld stump grinders, which minimize fatigue when working. Or – in our fully hydraulic and tracked stump grinders – via a precisely controllable remote control of all functions. The operator benefits from optimum view on the grinding area from a safe distance. Without impairments due to removed grinding material or dust. As known from JBM machines, your safety is highest priority in our stump grinders. The additional burst protection of pressurized hydraulic hoses, the stable grinding wheel housing with its comprehensive stone chip protection or the practical dead-man switch – just a few of many devices for occupational safety without compromises. Stump grinder, tree stump grinder or tree grinder? Everybody talks about stump grinders. And everybody has a different name for them: stump grinder, tree stump grinder or tree grinder. But, they all have the same goal: to grind wood. Handheld Stump Grinder or Hydraulic and Tracked Stump Grinder? 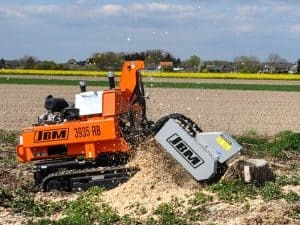 The hydraulic stump grinder on crawler track significantly simplifies your work: It grinds hard wood into small wood pieces – powerful, robust, and persistent. Whether via stationary control or optionally with remote control. Benefit from outstanding off-road capabilities. 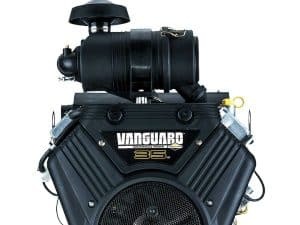 Engines from B&S: Benefit from high power density with a compact engine block design. The handheld JBM 2914 BD stump grinder is equipped with large wheels allowing the machine to be pushed easily. Large knobby tires ensure best driving characteristics, even in difficult terrain. Integrated lowering brake valves ensure safe operation of our JBM 2935 BD on sloping ground or loading ramps. The machines with single-axle chassis are equipped with a mechanical wheel brake. This ensures stability of the stump grinder during grinding. JBM stump grinders 2914 BD and 2935 BD distinguish themselves by extremely small machine dimensions for their respective power class. The dimensions of the 2914 BD are 60 cm and of the 2935 BD 75 cm. Based on that, these machines can also be used in the case of extremely restricted access dimensions. The JBM 2935 BD can be manually pushed by disengaging the traction drive. Transport lugs are installed on the machine for safe transport. The KDS system is an integrated swivel system, where the upper carriage is connected to the chassis via a ball bearing mounted turntable. This way, the stump grinder can be swiveled independently from the wheels. This concept results in significantly more customer benefits. The balanced machine weight in connection with an optimum operator handle bar provide additional work simplification. The height-adjustable operator handle bar allows safe, ergonomic operation in every grinding position. 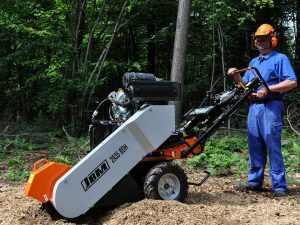 All handheld stump grinders made by JBM impress with robust grinding arm mounting. This is achieved by generously dimensioned, widely spaced grinding arm bearing points. This low-maintenance design reliably absorbs extreme loads occurring during stump grinding. In the JBM 2935 BD, the grinding wheel is reliably and safely driven via a magnetic clutch, which can be electrically activated. Large pulleys allow a powerful and durable drive. Belt drives are significantly more reliable than toothed belt drives. The high forces occurring during stump grinding are absorbed by stable, generously dimensioned bearings. The segment grinding wheel with optimized cutting wheel layout ensures consistent, powerful grinding performance. 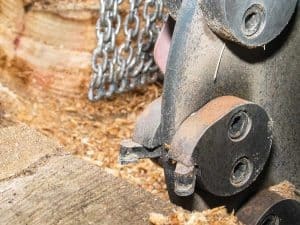 All cutting blades are connected to the grinding wheel via a quick-clamping device. The cutting blades can be easily replaced within shortest time. Thanks to carbide metal plates (Widea plates) specially designed for this application, a high blade service life is ensured. 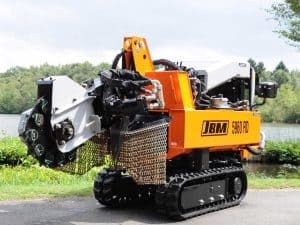 In the case of JBM single-axle stump grinders, the dead-man switch (EMERGENCY OFF) is realized by a circumferential safety bar on the operator handle bar. This enables safe operation of the stump grinder. The chassis drive of single-axle stump grinder JBM 2935 BD is realized via an electro-hydraulic joystick. Driving forward as well as in reverse can be activated. The grinding wheel of the JBM 2935 BD is activated electrically via a magnetic clutch. Activation as well as forced stop are realized within an extremely small time window. This means safe and efficient operation. In the case of JBM single-axle stump grinders 2914 BD and 2935 BD, a turntable positioned between wheel axle and grinding unit enables simple and ergonomic operation. The horizontal swivel movement can be realized with significantly less effort. At the same time, the swivel movement is decoupled from the conditions of the underground. 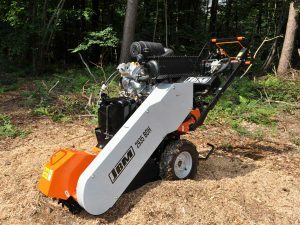 The operator handle bar in a handheld stump grinder can be adjusted to different heights so that the operator can always adjust the optimum operator handle bar height depending on the grinding depth. Our contribution to ergonomic grinding with manually operated stump grinders. All JBM single-axle stump grinders are equipped with mechanical parking brakes for grinding work optimization. All points relevant for maintenance and service are immediately visible and can be easily accessed. All lubrication points can be lubricated quickly and easily. All belt drives are tensioned easily, safely, and quickly using quick-tensioning systems. JBM stump grinders offer maximum personal protection during operation as well as maintenance. 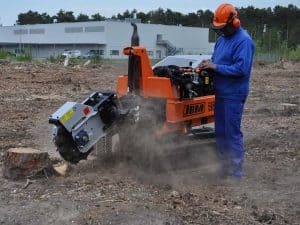 For this purpose, our stump grinders are designed according to the high requirements of the GS standards and relevant regulations of the employers' liability insurance associations. The grinding wheel runs in a particularly stable grinding wheel housing, which reliably prevents the uncontrolled discharge of grinding material. Special blade steels ensure a high cutting capacity with very high service life. Blade breakage is avoided at the same time. All machines are additionally equipped with a so-called “dead-man switch function). As soon as the operator leaves his position, the machine switches off automatically. A hinged 3-part spray protection wall (1 meter each) provides additional protection from flying grinding material. Service and maintenance: All areas and assemblies relevant for maintenance can be inspected immediately and are well accessible in JBM stump grinders. The air cooler is additionally protected using a fine particulate filter, which can be easily cleaned. The special installation space concert in fully hydraulic JBM stump grinders ensures an optimum position of drive engine, air filter and air cooler. They are installed at maximum distance from the grinding area. This reduces maintenance and increases the service life of the engine due to reduced dust in the intake area of air filter and engine cooler. The hydraulic traction drive with differential in machines with wheel drive allows fast and effortless transport of the stump grinder to the grinding area. Depending on the configuration, operation is realized via a stationary, swivelable compact hydraulic control block or via a radio remote control. By default, all machines are equipped with lowering brake valves so that they can be operated without danger on sloping ground or loading ramps. Large knobby tires ensure best driving characteristics, even in difficult terrain. By widening the wheel track, the stability of the machine with hydraulic wheel drive can be increased even more. 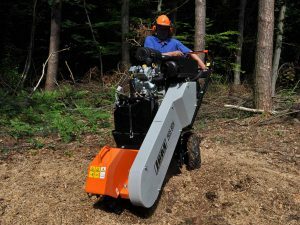 An alternative to the stump grinder with wheel drive is the robust crawler chassis made by Hinowa with powerful drive engine. Driving in difficult terrain is possible without problems as well as tackling of inclines. This high traction with low ground pressure is a significant advantage of our crawler tracks. Thanks to the crawler chassis, stability during grinding activities is unsurpassed. The grinding capacity can be increased even more. The opposite-running tracks allows spot-turning of the machine. 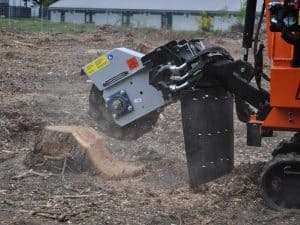 Thanks to the telescopic crawler track, the tracks can be pushed apart hydraulically increasing the stability of the stump grinder significantly. This increases driving safety in particular in difficult, uneven terrain. All stump grinders excel in their respective power class with extremely small machine dimensions. 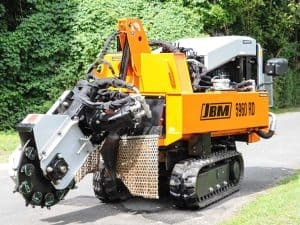 The JBM 3935 RBH has a width of 79 cm and the machines of the JBM 59 RDH series of 88 cm. Based on that, these machines can also be used in the case of extremely restricted access dimensions. The fully hydraulic stump grinders have a very low center of gravity due to the special design of the center engine concept. The result is significantly higher stability during transport in difficult terrain as well as during grinding. Transport lugs are installed on the machine for safe transport. The entire machine can be safely lifted using a central lug. The grinding arm is swiveled horizontally as well as vertically via a central control block with integrated chassis control. The swivel speeds are adjustable. The proportional valve technology enables a precisely dosed continuous advance motion. The hydraulic control block can be swiveled to improve the view on the grinding work. The grinding arm is swiveled horizontally as well as vertically via a radio remote control. The swivel speeds are adjustable. The proportional valve technology enables a precisely dosed continuous advance motion. Thanks to the machine concept with fixed engine, we can achieve an extremely high swivel range with consistently good stability in our fully hydraulic machines. The actual swivel range (not to be confused with the swivel radius) is 145 cm. As a result, the machine must usually not be moved even in the case of large tree diameters. 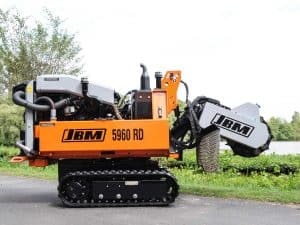 Thanks to the machine concept, where the engine is decoupled from the vertical swivel movements, our tracked and fully hydraulic machines achieve an extremely high vertical swivel range with consistent stability. This is significantly better than machines, where the engine follows the swivel motion of the swivel arm. 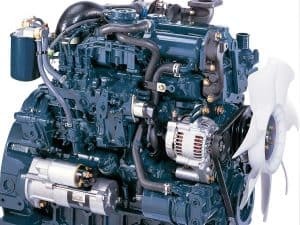 At the same time, the engine service life is increased as optimum engine lubrication is ensured in every working position. The result is a very large grinding range above and below the ground level of 50 cm. Stable, widely spaced swivel arm mounts ensure a stable continuous grinding movement. A the same time, the high vertical and horizontal forces are absorbed optimally. This is a prerequisite for vibration-free grinding. Based on the design, the grinding bar mount cannot deflect. 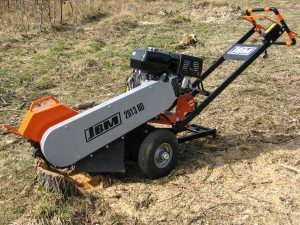 All stump grinders made by JBM impress with robust grinding arm mounting. This is achieved by generously dimensioned, widely spaced grinding arm bearing points. This low-maintenance design reliably absorbs extreme loads occurring during stump grinding. The small grinding width based on the v-belt drive with hydraulic motor on top allows optimum view on the grinding area. The lifting and swivel movement is controlled via largely dimensioned hydraulic cylinder with optimum geometric steering position and results in high rigidity during grinding. Possible vibrations and sudden grinding wheel movements are avoided. This enables continuous and low-vibration grinding. In machines with stationary control block, the dead-man switch is integrated in the control block. The ergonomic design of the dead-man switch allows activation as well as forced stop within an extremely small time window. This means safe and efficient operation. In machines with remote control, the dead-man switch is realized using an automatic grinding wheel emergency stop in the case the switch is not operated. Release is via a button signal. A maximum in efficiency and safety. All swivel and driving functions are operated via a stationary control block with proportional valve technology. This enables continuous sensitive operation. The swivelable stationary hydraulic control block allows an optimum view on the grinding area. The grinding function is activated electro-mechanically. All swivel, driving, and grinding functions are operated via a radio remote control with proportional valve technology. 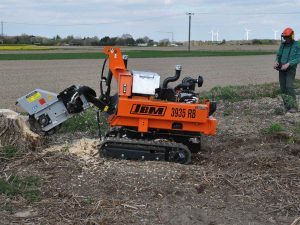 In short: Stump grinding without compromises. 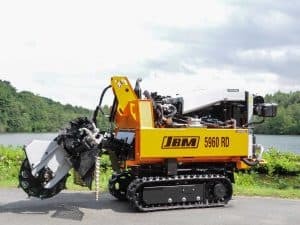 In the case of fully hydraulic JBM stump grinders, all swivel, grinding, and driving functions are operated via a remote control with integrated safety control functions. Precisely dosed activation of all hydraulic functions allows thus continuous vibration-free working. The stationary control block offers alternative operation of all swivel, grinding and driving functions with integrated dead-man switch. It can be swiveled for improved operator friendliness. Unique vibration-free operation thanks to slip-resistant hand rest on stationary hydraulic control blocks. The service hoods are mounted interlocking via rubber dampers. They can be opened easily and without tools. All points relevant for maintenance and service are immediately visible and can be easily accessed. Fully hydraulic JBM stump grinders offer maximum personal protection during operation as well as maintenance. For this purpose, our stump grinders are designed according to the high requirements of the GS standards and relevant regulations of the employers' liability insurance associations. All grinding wheel run in a particularly stable grinding wheel housing, which reliably prevents the uncontrolled discharge of grinding material. Special rubber mats against stone chipping are mounted in the area of the grinding arm, which reduce the ejection of wood chips, soil and stones to a minimum. In addition to the special rubber mats, a chain guard is installed on machines with fully hydraulic drive. 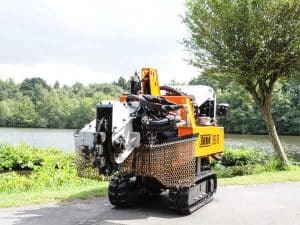 Tracked and fully-hydraulic stump grinders with stationary operation are configured with a personal protection curtain. In tracked and fully hydraulic machines with stationary control, the so-called "dead-man switch function” is integrated in the hydraulic control. As soon as the operator leaves his position, the machine switches off automatically. In machines with remote control, the grinding process is automatically interrupted via an integrated program inquiry, as soon as non-actuation of the remote control is detected.